Our Holiday Banners are in Stock!! Who’s ready for Fall? We have new holiday banners in stock to make sure you are ready for the Holiday seasons! We have Halloween, Thanksgiving, Christmas, New Years, Sports, Football and much much more!! These banners, Decorative Flags, and Garden Flags, Etc… are all made in the U.S.A. ! !Come check it out or visit our website at www. Flag-works.com! Also, Have a wonderful weekend, from our Family here at Flag-Works, To ours! This entry was posted in American Flags, Applique Custom Flag, Bunting Fans, Decorative Flags, Flag-Works in General, Flags, Message Flags, Open flags, Poems, Red Sox, Religious Flags, Sports and tagged Buy Garden Flags, Concord NH, custom applique, Decorative Flag, Decorative flags, Flag-Works, football flags, Garden Flags, Made in the USA, open flags, Seasonal Garden Flags, us flag on August 18, 2016 by admin. Flag-Works has come a long way since its inception 20 years ago, but its the people we have serviced that really made Flag-Works grow into a successful business. When I first purchase a room full of flags, I started selling them from the trunk of my car. The idea was to stop where ever I saw a faded or torn American flag and provide them with a replacement on the spot. Well my first stop, of course, was someone I knew. That stop was at the time T&T Power, he purchase 4×6′ nylon American flag with sewn stripes and embroidered stars. My firsts sale. Thank you Bill. Since then T&T power has successfully grown into a multi million dollar business now known at North Country Tractor Supply doing business selling John Deere tractors in Concord NH, Dover NH, Ossippi NH, Sanford Me. Congratulation on your great success. Okay, that sale was a setup. Not the next one. I went 300 yards down the road, and saw two big faded flags at Merriam Graves gas supply. 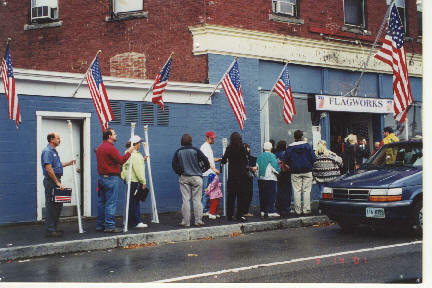 I walked in and sold them a 5×8′ US flag with sewn stripes and embroidered stars and a 5×8′ state of New Hampshire flag. I then went out and lowered their faded flags and installed the new ones. Merriam Graves is now Airgas with multiple locations through out the area. They are still a customer and we wish them well on their continued success. I continued to travel the surrounding area knocking on doors and selling flags. 204 South Main St. Concord NH, was conveniently located next to Vinnies Pizza (great pizza), which had plenty of parking and visibility. However, I soon out grew that space, and added the location beside me. I was growing, sales in American Flags and decorative flags was brisk. Fortunatly, I saw that custom flags should be a larger part of my work. That happened. We soon grew into on of the premiere custom applique manufacture in the country. I’m not going to list them here but I will be creating a larger gallery on my website for them. To name a few, Raytheon, New Jersey Net, Post Cereals, Roger Williams University Etc. 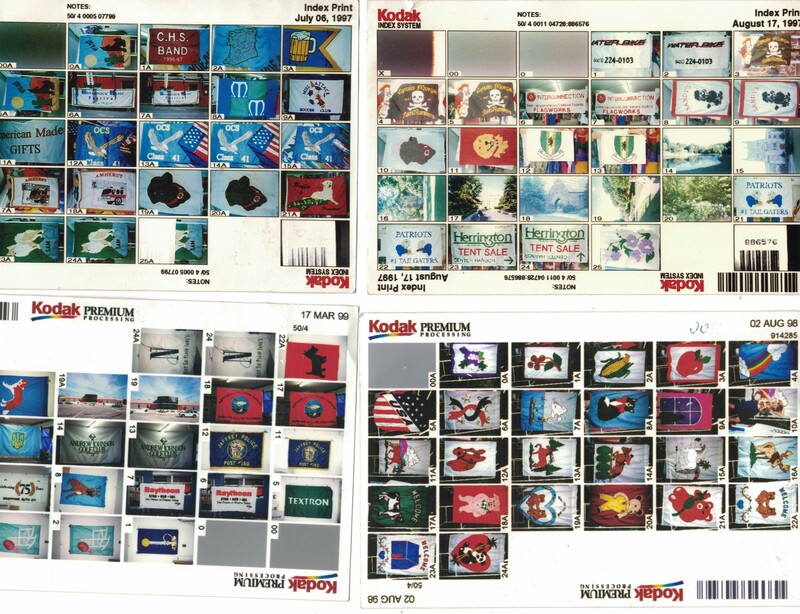 Below are index cards of our past customers flags. More later. This entry was posted in American Flags, Flag-Works History, Flag-Works in General and tagged american flags, Concord NH, custom applique, Flag-Works on February 25, 2016 by admin. Take a look at that big flag up on your flagpole. Are you in need of a new one do you fly a heavy duty nylon American flag, if so, now is the time to move up to a Polyester American flag from Flag-Works. 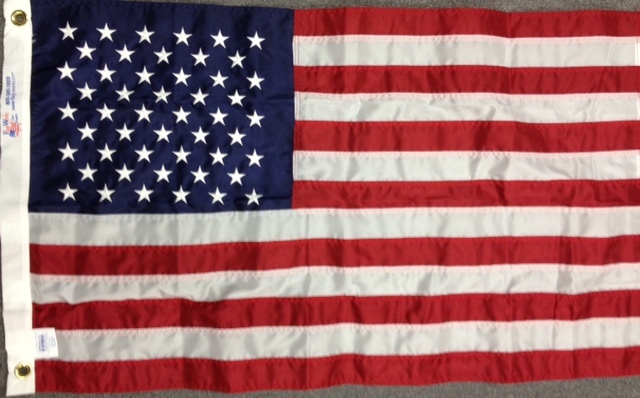 We have never seen prices this low in twenty years for these high wind, high quality American made flags. As we move into 2016 we are adjusting our prices where ever we can in honor of our 20 years in business. Please tell your friends, and like us on Facebook. This is now our everyday new low price. This entry was posted in American Flags and tagged 10 x 15 American flag, 10' x 15' American Polyester Flags, 12' x 18' American Nylon Flags, 12' x 18' American Polyester Flags, 15' x 25' American Nylon Flags, 15' x 25' American Polyester Flags, 20' x 30' American Flags, 20' x 30' Polyester American Flags, 20' x 38' American Nylon Flags, 20' x 38' American Polyester Flags, 30' x 50' American Nylon Flags, 30' x 50' American Polyester Flags, 30' x 60' American Nylon Flags, 30' x 60' American Polyester Flags, 50' x 80' American Flags, 50' x 80' American Polyester Flags, american flag, american flags, american flags for sale, American Polyester Flags, buy american flags, Concord NH, Flag-Works, Large American Nylon Flags, Large Polyester American Flags, Made in the USA, Polyester American flags, Polyester American Flags on Sale, Sales on Polyester American Flags, us flag, us flags, US Polyester Flags on January 27, 2016 by admin. Join us Friday, September 19 from 5:00 – 8:00 pm for Discover Downtown Concord, NH! Dozens of store and businesses will extend their hours until 8pm and will feature special promotions, discounts, raffles, refreshments and more. In addition to a fun and festive evening of shopping, downtown Concord will also showcase local artists, music, demonstrations and fun! Come and enjoy an evening stroll and Discover Downtown as a great place to eat, shop, dine, play and live. Discover Downtown is an event series and campaign designed to encourage and draw people downtown for shipping, dining, enjoying and building community throughout the year. For a complete list of participating businesses please visit: www.intownconcord.org. This entry was posted in Uncategorized and tagged American Cowboy Supply, Concord NH, Cowboy Boots, Dine, Downtown, Music, Shopping, Western Boots on September 17, 2014 by Courtney. This is Flag-Works over America’s window at 6 North Main Street, Concord NH. This expert design was created by Janice of Deja Veil located at 8 North Main Street, Concord NH. I’ve had this window for more than 10 years and it has never seen the likes of anything like this. 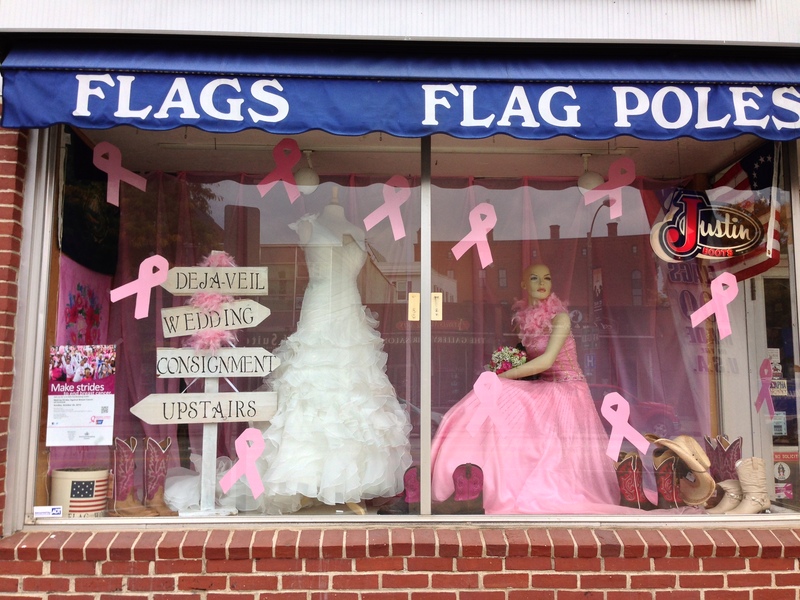 I know there is not much in the way of American flags or fiberglass flagpoles but this is for a great cause. We are very excited for these fresh new designs. I wonder what Halloween will bring. This entry was posted in Flag-Works in General and tagged american flags, Cancer, Cancer research, Concord NH, Deja Veil, fiberglass flagpoles, Flag-Works, making strides on October 14, 2013 by admin.